ALI-ABA - Provider of continuing legal education in the United States since 1947, offers a comprehensive curriculum of post-admission legal education - courses, course materials, video and audio tapes, satellite broadcasts, books, magazines, computer disks, electronic publications, plus much more. California Continuing Education of the Bar (CEB) - CEB has been providing for the continuing legal education needs of California lawyers for over 50 years. An extensive catalog of legal practice guides, periodicals, and electronic research tools is available on the CEB site. In addition, an on-line calendar provides information about the many live and taped seminars presented at locations all over the state. Celesq - Quality curriculum for fulfilling continuing legal education requirements. Courses are offered in a variety of easy-to-use formats including audio, video or text, online and offline. Center for Continuing Education (CCE) - CCE has been providing high quality CLE programs since 1992, featuring highly renown speakers. CCE's audio catalog includes programs in the areas of Sports and Entertainment Law, Harassment, Criminal Law, Ethics and numerous other areas. All audio programs feature digital recording. 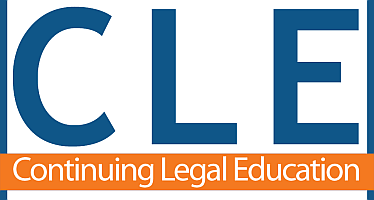 CLE Online - Delivers quality, continuing legal education programming in the form of online seminars to attorneys and other legal professionals via the Web. Continuing Legal Education & Training (ABA) - As the central resource for both the American Bar Association and the profession at large, ABA-CLE prides itself on distributing up-to-date, top-notch CLE in a variety of convenient formats. Corporate Law Institute - M&A and securities practitioners, Delaware Supreme Court and Court of Chancery judiciary, leading corporate counsel and Wall Street investment bankers gather in New Orleans every spring for the Tulane Corporate Law Institute educational and networking conference. Euromoney Legal Training - Training in broad range of specialised financial law-related subjects Capital Markets, Corporate Finance & Advisory, Securitisation, Derivatives & Financial Instruments, IT & E-Commerce, Project Finance, Regulation & Compliance, Corporate Banking, Trade Finance. Shipping. Tax & Trusts. HG.org: CLE - Comprehensive information concerning Continuing Legal Education (CLE) and Mandatory Continuing Legal Education (MCLE). Illinois Institute for Continuing Legal Education (IICLE) - The IICLE's mission is to serve the legal profession (and, thereby, the public) by assessing the Illinois lawyer's career-long educational needs and by being the profession's primary source for filling those needs. IICLE's publications and courses are intended to provide current and accurate information about the subject matter covered and are designed to help attorneys maintain their professional competence. Institute of Continuing Legal Education (ICLE) - A nonprofit continuing legal education organization, entirely self-supported by its course registration fees and publication sales. ICLE's mission is to provide easy access to high-quality, practical, legal information and education to practicing attorneys. Internet for Lawyers - Providing law firms, corporations, and local and state Bar Associations around the country with professional CLE programs. Law Depot - MCLE for California attorneys and paralegals. Law Policy and Institutions Guide - Provides links to major CLE providers. Lawline - Broadcasting continuing legal education on the Internet. LawProse, Inc. - CLE training in legal writing, editing, and drafting. All our seminars are conducted by Bryan A. Garner. Garner is editor in chief of Black's Law Dictionary and the author of many leading works on legal style, including A Dictionary of Modern Legal Usage, The Elements of Legal Style, The Redbook: A Manual on Legal Style, The Winning Brief, and Securities Disclosure in Plain English. His magnum opus, the 879-page Garner's Modern American Usage, is widely considered the preeminent authority on questions of English usage. In addition to the 100-plus seminars Garner teaches each year, LawProse also consults with law firms on revising appellate briefs, with companies and trade associations on translating contracts and other consumer documents into plain English, and with courts and government agencies on projects such as rewriting rules of procedure and simplifying model jury instructions. LegalSpan - A leader in online continuing legal education. Lorman Education Services - A leading provider of continuing education seminars in the United States and Canada. Minnesota CLE (Minnesota State Bar Association) - A not-for-profit division of the Minnesota State Bar Association, is the leading provider of seminars, institutes, books and other educational materials for Minnesota's legal community. Minnesota CLE offers programs in virtually all fields of law practice for lawyers with all levels of experience. To increase out-state practitioners' access to educational opportunities, Minnesota CLE videotapes most live seminars and distributes them to a number of locations through its Statewide Video Seminar Network (SVSN). NALA Campus - Published by the National Association of Legal Assistants, this site offers long distance learning courses for paralegals and secretaries. National Constitution Center - An independent, non-partisan, non-profit organization established by Congress dedicated to increasing public understanding of, and appreciation for the Constitution, its history, and its contemporary relevance. Produces high-quality audio conference programs serving the informational needs of the legal community across the United States. National Law Foundation - To provide outstanding speakers on important topics. We now offer live seminars, self-study materials(tapes, cds, dvds) and online courses. National Practice Institute (NPI) - NPI's mission is to fulfill the continuing education needs of attorneys with relevant, practical and entertaining CLE seminars and self-study programs. NPI is a trusted resource for lawyers, firms, courts, law schools, bar associations and corporate law departments. New York CLE (New York State Bar Association) - For more than 100 years, the New York State Bar Association has shaped the development of the law, educated and informed the profession and the public, and responded to the demands of a changing society. Each year the Association sponsors continuing legal education programs throughout the state of New York. Serving the entire legal profession, from new attorney to veteran practitioner with many years experience, programs range from introductory to in-depth, advanced level presentations. New York State's Continuing Legal Education Program - Implemented through the collaborative efforts of the bench and the bar. Seeks to enhance the New York Bar in serving clients and the public. Pennsylvania Bar Continuing Legal Education - Designed to be as useful as possible to Pennsylvania lawyers, this site features many pages of annotated links as well as information on the Institute's upcoming seminars and available publications (more than 300 titles). The Pennsylvania Bar Institute is the continuing legal education arm of the Pennsylvania Bar Association. Pincus Professional Education - MCLE for attorneys and legal professionals. PLI - Instant access to top-notch continuing legal education content is available 24 hours a day in a growing library of legal-education programs delivered interactively via the Web. Each program combines audio, text and graphics for powerful delivery on critical subjects. Features include access to other PLI content on the subject, links to dozens of related resources on the Web, and interactive self-tests. Earn MCLE credits. Search for CLE Programs - From WestLegalEdcenter.com. Texas Bar CLE - With thousands of hours of CLE produced each year, Texas Bar CLE offers one of the most extensive collections of educational materials for Texas attorneys. Register for upcoming courses, search and download topic articles, view summaries of recent important cases, and earn credit by attending online programs. University of Texas at Austin School of Law CLE -The University of Texas Department of Continuing Legal Education sponsors approximately forty conferences each year on a wide variety of legal topics. About half of the conferences take place in Austin, with the other half spread among other Texas cities. Although the conferences are designed primarily for attorneys and other law-related professionals, non-lawyers are invited to attend as well. West LegalEdcenter - More than 2000 accredited online CLE programs from over 75 local, state and national providers. This webpage last updated on Monday, April 17, 2017 12:30 PM.